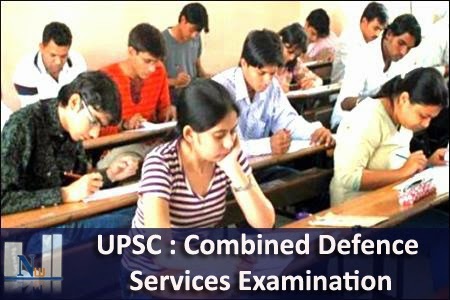 A Combined Defence Services Examination will be conducted by the Union Public Service Commission on 15thFebruary, 2015 for admission to the under mentioned courses. (i) For I.M.A. and Officers’ Training Academy Degree of a recognized University or equivalent. (ii) For Indian Naval Academy Degree in Engineering from a recognized University/ Institution. (iii) For Air Force Academy Degree of a recognized University (with Physics and Mathematics at 10+2 level) or Bachelor of Engineering. Note: Graduates with first choice as Army/Navy/Air Force are to submit proof of graduation provisional certificates on the date of commencement of the SSB Interview at the SSB. Candidates who are studying in the final year semester Degree course and have yet to pass the final year degree examination can also apply provided candidate should not have any present balck log up to the last semester year for which results have been declared unto the time of submission of application and they will be required to submit proof of passing the Degree examination at the time of SSB to reach the Army HQ/Rtg. CDSE entry, West Block 3 RK Puram New Delhi but they will be required to submit proof of passing the degree examination to reach the Army HQ/Rtg. CDSE Entry, West Block III, R.K. Puram, New Delhi-110066 in case of IMA/SSC first choice candidates and Naval HQ “DMPR”, (OI & R Section) Room No. 204,‘C’ Wing, Sena Bhawan, New Delhi- 110011 in case of Navy first choice candidates and PO3(A)/Air Headquarters,‘J’Block, Room No. 17, Opp. Vayu Bhawan, Motilal Nehru Marg, New Delhi-110011 incase of Air Force first choice candidates by the following dates failing which their candidature will stand cancelled : (i) For admission to IMA, Indian Naval Academy and Air Force Academy on or before 13th November,2015. (ii) For admission to Officer’s Training Academy, Chennai on or before 1st February 2016. Candidates possessing professional and technical qualifications which are recognised by government as equivalent to professional and technical degrees would also be eligible for admission to the examination. Indian Naval Academy, Ezhimala-Course Commencing in July, 2016 Executive (General Service) (including 06 vacancies reserved for NCC 'C' Certificate holders (Naval Wing). Officers Training Academy, Chennai, 103rd SSC Course (for Men) commencing in April, 2016. Officers Training Academy, Chennai 17th SSC Women (Non-Technical) Course commencing in April, 2016.